There’s an incredible power to unlocking its mysteries, and in succeeding, despite its demand for a pound of your flesh. Bloodborne succeeds through sparse storytelling, lush atmospheres (conjuring up notions of the best of Lovecraft’s work), and tight combat that forces you to be aggressive. While this new IP doesn’t stray far from the established Souls franchise, it is a magical, wondrous work that admirably instills both terror and triumph in those brave enough to delve into it. Though not as refined and freeform as some of its predecessors, it continues in the longstanding Souls tradition of lending credence to challenging games and making the seemingly Sisphyean task of conquering ruthless, malformed monstrosities possible and downright commendable. There’ll be times when you feel genuinely lost, frustrated and unsure of your next step. But you will carry on, you will beat it, and when you do, there’s no other game that can make you feel more elated about doing so. It's exactly what Miyazaki and the rest of his team promised. A dark, sick universe where you'll be constantly spiraling. It has courage, as it takes the legacy of the Souls saga in a new direction, it has an unique Victorian style, and it has one of the most impressive settings ever, as Yharnam will really stick with you. It isn't perfect, maybe rough around some technical and online edges, but it's still the quintessential action RPG of the modern age. Bloodborne is a sterling example of what can be achieved with the latest technology while also recalling an older, simpler time, where a game’s actual structure, gameplay, and content took precedence over its potential profitability. The PlayStation 4 finally has its exclusive killer RPG. Only Bloodborne would be so bold as to bury an entire factional player-versus-player mechanic within an optional region, which is in turn buried within a series of oblique steps you might miss if you aren't exploring every nook and cranny, or ignore the game's enigmatic hints. I finished Bloodborne in less time than I did Dark Souls II, yet I treasure it more in spite of its few missteps. Bloodborne is easily an early contender for game of the year, and it's the best PS4 exclusive to date. A new masterpiece on PlayStation 4. Whether it's an accomplished dream or a recurring nightmare, spending a bloody night will never have the same meaning, particularly for mere mortals. I started Bloodborne scared and unsure, quaking in my boots every time a new enemy showed its ugly face. I was horrified, timid and alone. But now, I have a confidence and strong sense of self. I am a hunter in Yharnam. I'm confident in my abilities, I know my weaknesses, and I trust my instincts. There's a real bloodlust that builds up in you once things start to click. You'll want to hunt, you'll want to kill, and you'll thirst for blood to make you more powerful. I find Bloodborne intoxicating, and I trust you'll find the same should you let it get into your system. Bloodborne is some of the best work From Software's ever done, a remarkable achievement and a shrewd turn from its Souls lineage. This is probably my new favorite title of next-gen consoles, but then again I could have just become assimilated to enjoy the pain. Now I just have to figure out if I should say thank you or just sit quietly until my next punishment. It is true that some players may feel that making any progress is far too difficult, I felt the same way when I began playing, but trust me this is not a game you want to skip. Don't be scared to try it, Bloodborne is a wonderful addition to the PS4 library and I cannot recommend it enough. Challenging, beautiful and deep, Bloodborne delivers a great experience that, even though reminding of other games made by From Software, is also unique in its own right. Bloodborne is like a wonderful nightmare you won't want to wake up from. The one blemish are the abhorrent loading times, which is a shame as they’re simply an optimization issue rather than a design one. Expertly crafted on practically every level, Bloodborne is a deviously delicious experience that deserves to be experienced by anybody valiant enough to conquer it. Bloodborne is an undisputed revelation. A dark and engaging adventure, with an excellent combat system, an ideal dose of innovation and fascinating exploration. The Old Hunters is a devilishly challenging addition to an already brutal game. With its release, Bloodborne transforms into an even beastlier and more grotesque experience, and it’s better than ever—a blood diamond in the rough even in a year chalked full of incredible releases. The Old Hunters has questions, has answers, and has some glorious new secrets to be uncovered. If you have already experienced Bloodborne, this add-on is absolutely essential. If you haven’t, it’s the perfect time to join the Old Hunters and journey through the streets of Yharnam and the new nightmares that follow. The Old Hunters is Bloodborne from another time and place, and with more difficult bosses and confounding stories to unravel, it's a fitting complement to the original, gruesome adventure. Far from tacked-on extra content, The Old Hunters is the expansion Bloodborne deserves, with morsels of lore, imaginative weapons, and engaging battles making it well worth your time and pain. Bloodborne: The Old Hunters is much more of the same from what is already an outstanding game. Bloodborne: The Old Hunters is a solid and enjoyable expansion that adds some much-needed new content to the game in exactly the right places. It's filled with content (almost 15 hours to get to the optional fifth boss), new weapons and more variety in the combat system, and even new fascinating areas of Yarnham. Fans should really consider buying this DLC, especially since it will be the only one dedicated to the game. A gruesome descent into hell filled with relentless challenge in every inch, The Old Hunters is a great continuation of Bloodborne, even if it ends feeling rather short and some recycled elements make it lose some luster. The Old Hunter’s is a great expansion for die hard fans of Bloodborne. It brings a good amount of fresh content to the game without doing anything to alter the formula. It’s more of the same, which is a good thing. Just be prepared for the difficulty as it is as unrelenting as ever. The Old Hunters provide invaluable hindsight through this nightmare, exhuming Yharnam's darkest secrets while fleshing out the gameplay with an extended set of tools. Therefore it's not only an addition to Bloodborne, but a truly fundamental part that should have been - and probably was - lying there from the beginning. Bloodborne: The Old Hunters is a solid add-on to an already outstanding game. While it fails to try anything new and is relatively short, the bosses make this something worthy of trekking through, especially for existing fans. A dense, intriguing, but ultimately safe expansion, The Old Hunters is more of the same brutal Bloodborne experience. I might sound down on a lot of aspects of The Old Hunters, but ultimately, it will satiate most fans out there. For the most part, The Old Hunters feels like a tight, good bit of content that fans of the original game will thoroughly enjoy. The Old Hunters ratchets up Bloodborne’s difficulty quite a bit. But in doing so, the satisfaction of beating bosses only gets stronger. Our Game of the Year for 2015 has had a similar affliction on our judges, and we just can't stop playing with it. Videogame awards are serious business, so let me not beat around the bush here...Congratulations to Bloodborne and everyone at Sony and From Software. Sick game. Also, a huge thanks to the game's lead programmer, Jun Ito, who rarely gets his name mentioned by the Western press. I don't know anything about this person or the countless others that also contributed, but Ito-san is surely like many of hard-working developers in the industry who sacrificed countless nights of restful sleep. Taihen arigatou gozaimashita. There can only be one winner, though, and it might not be the most popular of choices. It's a platform exclusive, which for good reason never goes down too well. It's a stubborn game too, which can scare off those who feel that video games are a more leisurely pursuit. Above all, though, it's a phenomenal achievement where art and vision combine to create one of the finest games of not just this year but any in recent memory. And so it is that From Software's Bloodborne is Eurogamer's own choice for 2015's game of the year. Bloodborne reeks of brutal brilliance. From Software's violent eviscerate-'em-up pegs you as a personality-less predator, as you stomp the Gothic cobbles of Yharnam in search of monstrous prey to mutilate. A spiritual successor to the Souls series, Hidetaka Miyazaki's vulgar PlayStation 4 exclusive adopts a more aggressive angle than its predecessors, relying on dodge rolls and risk taking rather than methodical melee. But it's this minor twist that makes the Japanese developer's latest a masterpiece – and a deserved winner of our 2015 Game of the Year award. Bloodborne is a very special game. Just reading everyone’s thoughts about it makes me want to play it right now. Bloodborne is not just a game that will stick with our community for a little while, it’s one that will create memories that last a lifetime. Thanks so much to everyone above for the great responses. And once again, congratulations to Bloodborne, the 2015 Gematsu community game of the year! A haunting and oppressive game world that will get your heart beating through your chest and your hands sweating. A faster-paced and more offensive combat style than previous Souls games. Grotesque and frightening enemy design. Alongside juggernauts stood Bloodborne, an unapologetically disturbed, decidedly grievous reverence to a scourge. Hidetaka Miyazaki creates a field of corruption and agony dedicated to killing you, but the game’s poignant themes stem from more than the harrowing screeches and increasingly disfigured creatures. Picking up the controller and choosing to resist Miyazaki’s unforgiving world, to feel the weight of failure with every movement through it, is the true confrontation with horror. ...And, heavens above, the world. Yharnam is a remarkable creation, another showcase of Miyazaki's peerless ability to stitch disparate areas into a world using devious paths and shortcuts. This is his finest spot of needlework to date, varied but believable, the urge to see what lies around the next corner undimmed by the knowledge that it's probably going to be something quite traumatic. The results, combined, are exquisite, cementing From as one of the finest studios in the industry today, and Miyazaki as one of its greatest designers. The PlayStation 4’s early-year hit remains the finest game of the year, a unique role-playing adventure that carefully balances a steep learning curve. Combat is as polished as ever, bettering the slow pace of Dark Souls with a slight dose of Ninja Gaiden, and the balance between explicit storytelling and gamer discovery is sublime. And if you want storied boss battles, something often missing in 2015’s games, they don’t get any better — or more colossal, at times — than the baddies you’ll encounter in Bloodborne. A more action-orientated spin-off from the Dark Souls series; this is arguably the best game of the generation, let alone year. The level and creature design is exceptional, pushing its players to feats of skill and perseverance that they never imagined they were capable of. The recent DLC was also excellent. There remains no rush in games as intoxicating as the one that follows the slaying of a difficult boss in FromSoftware's "Souls" series. "Bloodborne" isn't literally a "Souls" game, but its name is the only disqualifier: The storytelling is still cryptic and the specter of instant demise is still everywhere. Further, Hidetaka Miyazaki's latest hastens the die, die again ritual of "Souls" by removing shields and all but requiring you to dodge or parry with perfectly timed gunshots. That and "Bloodborne's" look — Lovecraftian viscera splattered on cobblestone and spiry Gothic corridors — make it a wholly fresh kind of nightmare. A dark, bleak and often disturbing adventure that riffs on the blackest gothic literature and eldritch horrors of HP Lovecraft, Bloodborne was not only 2015’s most savage and bloodcurdling romp but the undisputed title of the year. A brutal, punishing, action-RPG, Bloodborne is a game that doesn’t hold hands and doesn’t pull punches. It thrusts the player into one life and death battle after another, with death generally being the likely outcome. Standard enemies are tougher than the bosses you’d encounter in most games, and the almost complete lack of hints or direction from the game can leave players feeling lost. But while it’s easy to see how this set-up could be frustrating, such is the quality of the design of the game that the ultra-rare moments of elation one experiences playing Bloodborne are worth all the moments of despair. Killing a troublesome boss on your thirty-fifth attempt evokes feelings of joy and relief that most other games can’t hope to replicate. And it’s those feelings that make Bloodborne the best game of 2015. Given that Bloodborne has snapped up six awards already here, it is no surprise that our writers voted it 2015's finest game. A towering achievement that takes in oppressive world design, fearsome challenge, superb combat and smart use of online. Not to mention the detailed lore that awaits its most dedicated fans. Most impressive is how coherent it all is, puzzle pieces slotting together to build a grisly, hard to fathom but undeniably beautiful picture. If Fallout 4 is a sloppy, but inviting mess, Bloodborne is the exact opposite. From the makers of Dark Souls, Bloodborne is obtuse and hard-as-nails, but you find yourself putting up with it, because it is, without question, the most solidly constructed game of the year. The world of Bloodborne is a perfectly twisted little knot, every enemy encounter feels like a unique, dangerous challenge, and the game is always firmly in control of its atmosphere and player expectations. Bloodborne somehow manages to make the classic Dark Souls formula more accessible without making the game feel dumbed down. An impressive achievement from developers working at the top of their game. For PS4, From Software's new IP Bloodborne beat out Battlefield Hardline to take the top spot. Although Bloodborne had the weight of Sony marketing behind it, the fact that it outsold Hardline--which was released a week earlier and is based on a famous franchise--is quite impressive. Of course, this chart counts digital sales only. 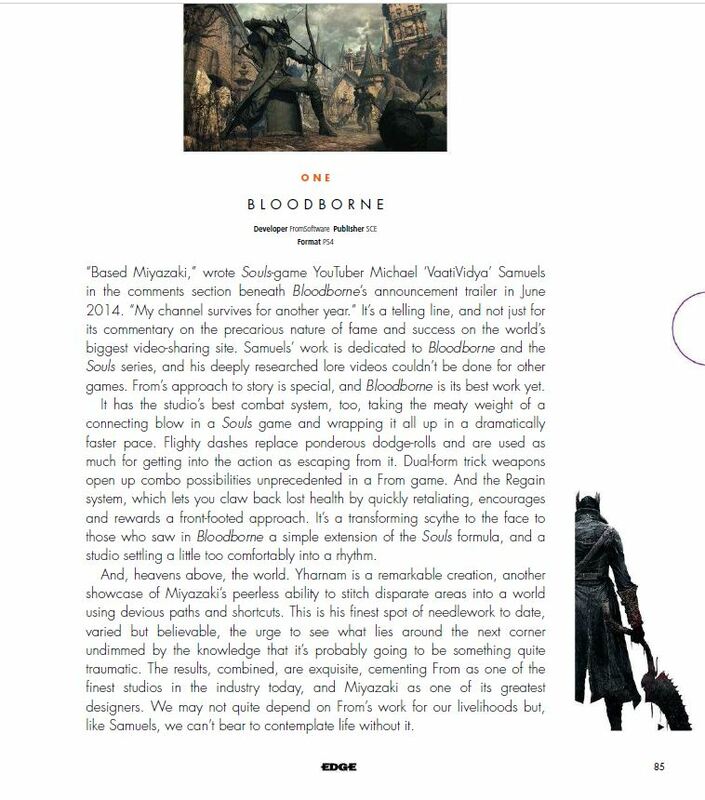 We are amazed and very grateful for the way in which the community has embraced Bloodborne. 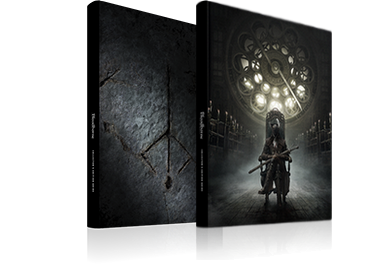 As you may have seen, we’ve just announced that Bloodborne has now sold through over one million copies worldwide. Thank you to everyone who has supported the project! - Masaaki Yamagiwa Producer, Sony Computer Entertainment Japan Studio. The number includes both Blu-ray disc sell-through quantities and download version sales on the PlayStation Store. *Includes both Blu-ray Disc sell-through quantities and download version sales on PlayStation Store. Sales data in Japan collected 3/26/2015 – 8/26/2015, in Asia 3/24/2015 – 8/26/2015, in North America 3/24/2015 – 8/26/2015, in PAL regions 3/25/2015 – 8/26/2015. “It did surprise us,” says Gara. “We had expectations to do well. We looked at the Souls series as a frame of reference, and we thought we could do better than that. We did – and then some. Relative to some of our sister territories, we were being quite ambitious, but even that proved to be conservative. All data is regularly checked against manufacturer shipments and data released publicly from other tracking firms to ensure accuracy.